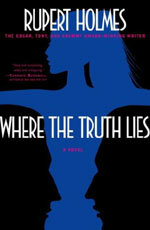 adapted as "Where the Truth Lies"
Synopsis: This novel of intrigue speeds from one vivid setting to another, all of them factually real even as they are fantastically surreal: a clandestine club in Disneyland with a dazzlingly well stocked bar; a dizzying Shangri-La of a castle hidden away in Burbank; a drive-in movie theater nestled below the most chic streets of midtown Manhattan; an elegant table for four perched thirty thousand feet above the earth. The tale is told by K. O'Connor, a vivacious, free-spirited young journalist known for her penetrating celebrity interviews and bent on unearthing secrets long ago buried by the handsome showbiz team of singer Vince Collins and comic Lanny Morris. These two highly desirable men, once inseparable (and insatiable where women were concerned), were driven apart by a bizarre and unexplained death that may have cast one of them as a murderer. As the tart-tongued, eye-catching O'Connor ventures deeper into this unsolved mystery, she finds herself compromisingly coiled around both men, knowing more about them than they realize and less than she might like, but increasingly fearful that she now knows far too much.